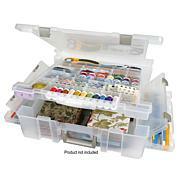 ART BIN-Super Satchel Thread Tray. 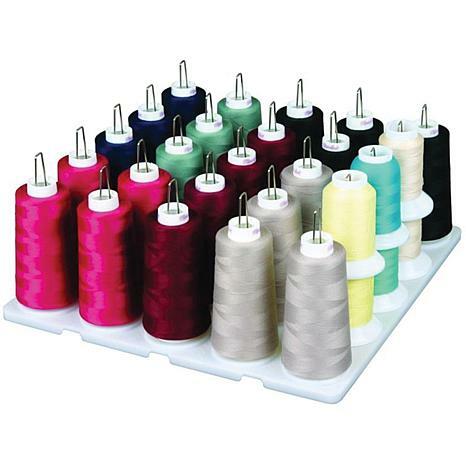 This sturdy base with easy to insert prongs holds a minimum of twenty-five and up to fifty serger thread spools. Fits in 6990AB Super Satchel Double Deep (not included). 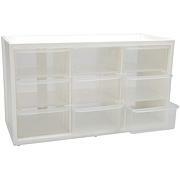 Measurements: 12-1/2x12-1/2x1/2in. Constructed of white plastic. Made in USA. 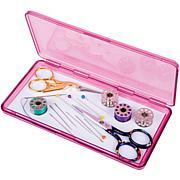 This is an inset for the ArtBin Double Deep Super Satchel. 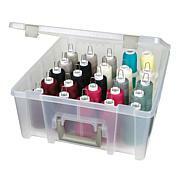 It is perfect for storing Serger/Cone threads. This is great for organizing cone thread I wish I had five of these. Very Cheaply made. All cones do not fit perfectly as depicted in photo.